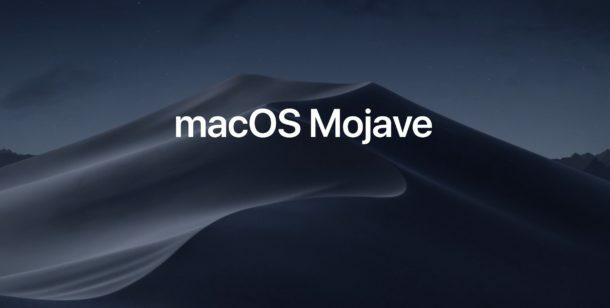 Apple has released the second developer beta version of macOS Mojave 10.14 for Mac users participating in the Mac OS beta system software testing program. MacOS Mojave developer beta 2 is available to download now for any user currently running macOS Mojave developer beta 1 on a compatible Mac. A public beta release of macOS Mojave is not yet available. Additionally, Apple has released new beta builds for iOS 12 beta 2, watchOS 5, and tvOS 12. If you’re not yet running macOS Mojave developer beta but you’d like to, you will need to get a developer beta testing profile from the Apple dev center as outlined here and then download the MacOS Mojave developer beta from the Mac App Store. Once that initial installation is complete the future software updates to MacOS Mojave will arrive through the System Preferences. If you’d like to create a macOS Mojave bootable USB installer drive you would want to do that before completing the initial installation of Mojave on a Mac. Currently macOS Mojave remains in developer beta, but a public beta release will be available for broader testing purposes in the near future. If you find yourself curious about testing the developer beta of macOS Mojave, installing the release on a secondary hard drive or partition is possible, or you can backup with Time Machine and then install the update over an existing macOS installation which can be downgraded from macOS Mojave and revert back to a stable Mac OS release if you decide developer beta system software is not appropriate for your usage. MacOS Mojave contains many new features including Dark Mode, dynamically changing desktop wallpapers, refinements to the desktop and Finder, improvements to Continuity, new apps like Stocks, News, and Voice Memos, and much more. The release date for macOS Mojave is set for the fall. Separately, Apple has released iOS 12 developer beta 2 for iPhone and iPad beta testers, along with watchOS 5 beta 2 for Apple Watch and tvOS 12 beta 2 for Apple TV. One interesting thing to note is that I have an Other World Computing 1TB SSD installed in my MacPro (Late 2013), and when I try to install Mojave, I am told that the storage on my Mac is not compatible and to contact the supplier directly for assistance. I have run beta’s for years and never had an issue. I also saw a post on a forum where a guy filed a bug report with the exact same issue and Apple came back and said that it wasn’t a bug, and to file a new bug report after Mojave was GM if he still had issues. So, is it that I am not able to run the beta but will be able to upgrade once Mojave is released? Or, will I not be able to upgrade at all???? That’s a good question, sounds like a bug report said time will tell? It is a beta so it is possible not everything is supported yet of course. Or maybe it’s possible that APFS is not compatible with the drive? Maybe skip APFS and use HFS+ instead? I am using HFS+ currently, haven’t even tried APFS. I’m not sure it’s a compatibility issue, I think it’s Apple doing a check to verify it’s Apple hardware. Update the Mac Pro to High Sierra, which should upgrade the drive to APFS, which should allow for Mojave to be installed. I read an article a while ago on OWC’s blog about speed tests of APFS and HFS+. I use several hard drives formatted as HFS+ for backups and clones. I never bothered installing High Sierra as it had way too many issues. After installing Mojave beta on an external SSD for multiboot, I left it at APFS and tried working with it. Copies of 2+ GB files to a shared HFS+ drive using SMB were quite slow and sometime caused the share to be dropped. On top of that, Mojave would sometimes list double directory names and double file names. Obviously not good. Also, if I booted Sierra, it could not recognize the APFS partition. Which makes sense. The older High Sierra instal package contains an program that can be used to instruct the installer not to use APFS, however that option appears to have been removed in the Mojave Beta installer. Boot times also increased to a couple of minutes or more when making Sierra the startup disk. There appears to be a lot of disk activity on the APFS volume during the boot – so something else is hosed too. It turns out, that the great cloning app, Carbon Copy Cloner doesn’t care if a volume is formatted as APFS or HFS+ (make sure to use the latest version). So after installing Mojave, I cloned it to a new HFS+ partition and back to a system that works with my machines, network and drives. And it’s fast. Eventually Apple will fix APFS, but for my use it’s not ready for prime time. You can just be lazy and pay $$$ to Apple to store and backup all of your data to iCloud and format any external drives to APFS. But if you want to mix in HFS+ drives to your setup, APFS still isn’t ready yet. Obviously you’ll need some extra drives to bounce clones around on, but you should still be able to get an HFS+ partition containing Mojave on your internal SSD, just use CCC (Carbon Copy Cloner). ps. if you go to the OWC blog and search for APFS articles, you should be able to find the article on speed comparisons.